So after the last entry I went a bit “I’ll fight the world as not fighting is making me feel very trapped/dependant/down”. Top of my list was the children’s centre access and parking. But I very soon realised that I don’t really want to access the centre anyway as the breastfeeding group that now meets there still doesn’t feel very me, so I was fighting it on principle only… I don’t have the energy to be that principled. I have been out and about with Jess in the car more. We’ve been to rhyme time twice (again not really my thing, but it’s short and sweet enough and local and free…oh and I can double yellow park outside) checked out the breastfeeding group again and done little errands shopping (admittedly overdone the walking there though, as manual wheelchair and sling really doesn’t work and the hoist takes too long). 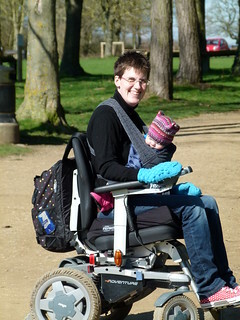 I have also been out with Jess in my temporary sling by foot, just a very brief potter and also in my powerchair for half an hour stints in the SUNSHINE! Simon has had 2 days off this week and we’ve enjoyed some extra family time. We baked, went for a long walk/wheel incl picnic. I went to get my eyes tested and tomorrow pick up my new glasses (a new look is always good right? I’ve taken baths with Jess and enjoyed anything from 10 minutes in bed reading afterwards to tonight’s half an hour as she is asleep on Simon! That warm out of bath (fresh sheets on one night) cosiness is bliss especially after the giggles of Jess in the bath. She’s one amazing little girl and I’ve felt that even more since I’ve been looking out for me more. 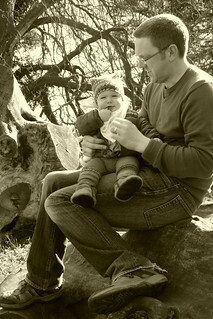 I should be getting my custom opitai baby carrier next week… watch this space!